Well, if you follow me on Twitter, you’ll have seen that I had an exciting appointment yesterday and I’ve been absolutely dying to share it with you lovely people (*kids herself that she has an army of readers already). 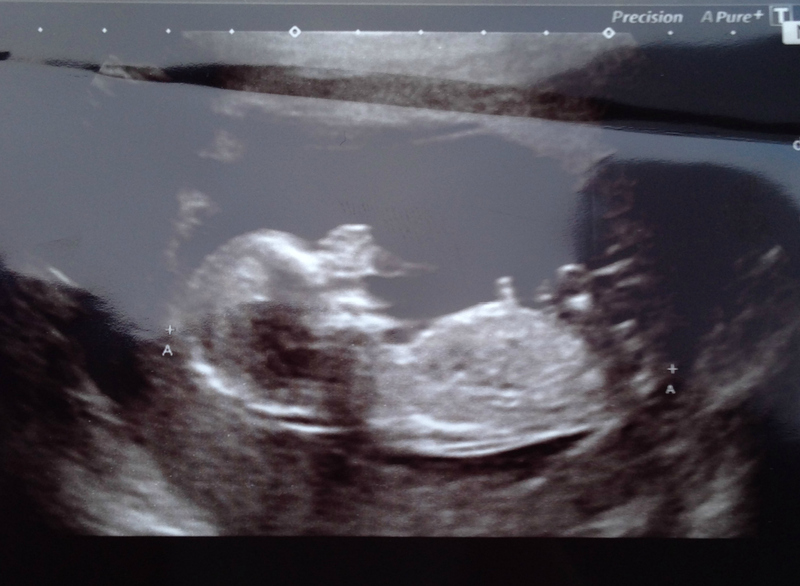 Mr M and I went to the hospital yesterday to see our baby for the first time in our 12-week scan. Yes, we are having a baby. My gosh, it all seems very real now that I’m writing it down. I’m going to be somebody’s mum. Who let that happen? So having found out just before Christmas, we had already told our families as I’m not usually one to turn down the offer of a glass of Prosecco and they would have guessed pretty quickly anyway. So they were all calling and texting on Tuesday night wishing me luck and telling me how exciting it was. But I didn’t feel excited. I was scared. I was nervous. I thought they would tell me there was no baby, or that something was wrong. Is that normal? I’m not usually a pessimist in any way and tend to look on the bright side, but I couldn’t seem to find my glass half full attitude anywhere. We arrived, as I’m sure most first-time parents do, 40 minutes early. “What if we have trouble parking?”, “What if they are running early and I miss my slot?” etc etc. I sat nearly throwing up with nerves in that waiting room. And then I was being called in and I was stuck to my chair. We’d been waiting for this moment all these weeks and suddenly I needed more time. As I lay down with Mr M sat at my feet and the lovely midwife by my side, I wanted to close my eyes. But boy was I glad I didn’t. That little human arrived on the screen and a bolt of emotion hit me full strength in the ribs. There it was. It was moving. It was all OK. I am struggling to put the feeling into words. Tears immediately rushed to my eyes. I wanted to cry and whoop and dance and hug Mr M as tight as I could. But of course, I quietly had a few tears and stayed very still to see as much as I could of our baby. Little R-M has earned itself the title of the most awkward baby in the hospital that week. It just would not get into the right position to have its measurements taken. It was lying with its back to us and kept going back to that position each time it was moved. After a while of prodding, poking, hip wiggling and knee bending, we were sent off for a walk and a coffee to see if it would shift. It did move, but this time it was sat bolt upright and would not lie down. After 15 minutes, we went for another walk and I had to run up and down the stairs a few times (as much as a pregnant woman can run, that is). Back we went, at which point Little R-M won its awkward award. We managed to get it measured – 77.5mm, which makes me 14 weeks tomorrow, further on than we thought, but it just would not get into the right place to have the neck measurement taken. I love that its already its own little person and is very sure of what it wants and where it wants to be. Independent like its mother. The best part of the awkwardness was that we got the most time watching Little R-M move around. We saw it laying down, sitting upright, on its hands and knees, looking straight at us, waving and at one point it was dancing. I kid you not. Towards the end, it kept putting its hands on its head. “Just leave me alone”. So I’m back for a quad test next week to test for Down’s, but I don’t mind and do you know why? I’m going to update you on how we found out etc over the next few days, but for now, I’m just going to look at our scan picture again. Aww congratulations – lovely news!